His relationship with judges could be better right now. You know who you&apos;re talking to, right, "Your Honor"? For five long years, Preet Bharara couldn’t miss. A media darling, he was cleaning up Wall Street, sending dozens of Wall Street&apos;s finest up the river for violating his interpretation of insider-trading rules and bringing an end to The Era of Cohen, at least as an official hedge fund manager. Until a few weeks before Christmas, when it all came crashing down. 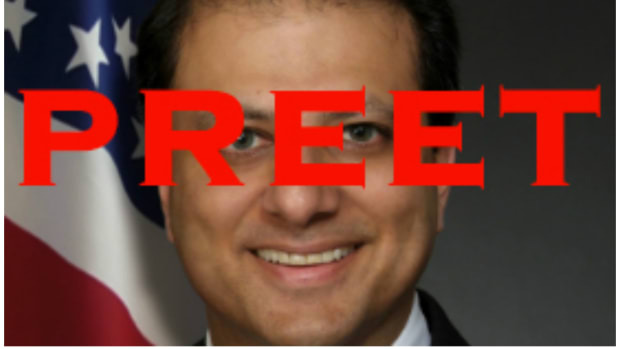 Looking for solace in his second-favorite hobby, indicting elected officials, Preet found to his horror that it wasn’t just subjecting white-collar types to perp walks that was starting to get under judges’ skin; it was him. And to be honest, he’s not taking it well. Preet Bharara, the United States attorney for the Southern District of New York and one of the most acclaimed prosecutors of his generation, is locked in what seems to be an escalating war of words with the federal judiciary — one that some judges fear could influence important rulings…. The most damage may have been done last summer. At what has been described as a freewheeling, off-the-record roast for a departing prosecutor, Mr. Bharara referred to Judge Naomi Buchwald, who had just presided over his office’s first loss of a major insider trading case, as “the worst federal judge” he’d ever encountered. Several of Judge Buchwald’s fellow jurists were at the party…. Now, that doesn’t sound much like our Preet, does it? And why should it? After all, he just convinced some schlemiel in Wyoming to plead guilty to insider-trading charges again, and on his terms! John Johnson, who previously admitted to trading on a tip about a $3 billion merger involving Foundry Networks Inc, has decided to re-enter his guilty plea, his lawyer said in a letter filed Thursday in Manhattan federal court. The decision came after prosecutors in March conceded that admissions Johnson made in 2013 about his trading were "insufficient" to support his original plea given the appellate court&apos;s view on what constituted insider trading. And to whom was this letter submitted? Why, to none other than U.S. District Judge Valerie Caproni. You know, the Valerie Caproni last seen giving Preet a verbal spanking over his handling of the Shelly Silver corruption case. How do you like him now, Val?